Crested Butte is Colorado's most serious ski resort. Seriously challenging, seriously scary -- and seriously fun. The mountain's almost-vertical, double black diamond runs, most of them accessible from a T-bar lift, are in a class by themselves. (A T-bar? Haven't seen one of those in years.) These slopes will put the fear of God in you even if you're a lifelong skier. And yet, the fun is serious, too. A series of much more forgiving blue and green runs are available for your kids, and there's no shortage of things to do in town, none of which involve you staring into a snowy abyss. Although Crested Butte is only a few miles over Italian Mountain from Aspen, Colorado's most high-profile ski area, it might as well be on a different planet. People don't come here to be seen, and there are no paparazzi tracking the few celebs who venture over the hill. Instead, everyone is here to ski. As soon as we picked up our lift tickets, we headed straight to the mountain. We'd already skied two resorts in Southern Colorado, some of which presented us with challenging terrain. But this was different. Really different. 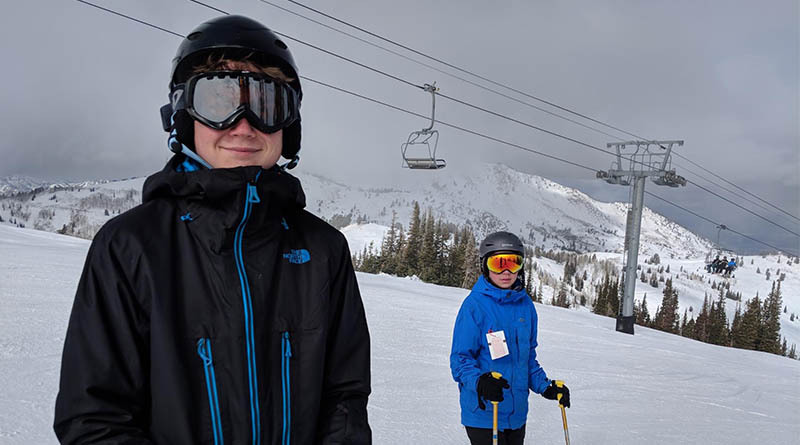 After a warm-up run on the Red Lady Express, which has a lot of mellow runs perfect for families, we headed over to the Silver Queen Express, a quad that services some of Crested Butte's steepest terrain. The last few hundred feet of Silver Queen are almost pure vertical, and you get the sense that coming down might be a chayllenge. "OK, kids," I said to my two boys, ages 13 and 15. "Playtime's over." "I'm not going down there," his older brother declared. Fortunately, you can change your mind and live to tell the tale. We pivoted on our skis and came down International, another black diamond run. The next day we met up with Wendy Fisher, a former Olympic athlete and X-Games competitor who offers ski clinics to people who might find the mountain a little intimidating. Yeah, that would be us. After just one trip down an easy run, Fisher diagnosed our problem: We were leaning too far back on our skis, which tires you out quickly and limits your ability to control your skis, especially on the steeps. Fisher is part mountain guide, part storyteller, part instructor. She has an encyclopedic knowledge of Crested Butte, is happy to regale you with stories of the 1992 Winter Olympics, and is eager to offer tips on improving your form. Iden, the fastest skier in our group, learned how to regain control even when zipping down the hill. Fisher showed Aren, our most cautious skier, how to relax a little and enjoy his runs. And me? Well, I had years and years of bad habits to overcome. I tend to ski with both my legs glued together. In German, it's called "wedeln." Fisher showed me how to trust my equipment, keep my legs apart, and let gravity do more of the work. Thanks to Fisher, we spent the next few days skiing every open run -- yep, even those seriously hard black diamonds. Thanks, Wendy. There's much more to Crested Butte than its legendary slopes. After two days of intense skiing, we got off the mountain and headed into town. We met up with Nel Burkett, curator of the Crested Butte Heritage Museum, who took us on a walk through the historic downtown and then offered a brief tour of the museum. It's funny, but when I asked the kids what they remembered, they said, "That's the town where all the buildings burned down." True, more than a few buildings on the tour had burned to the ground at some point in history. Crested Butte has a fascinating history as a coal mining town and a center for environmental activism, and there's still an interesting mix of money and idealism here. You can find impressive, million-dollar mansions in the hills, but you can also run into a few old-timers who live more modestly. And you can visit shops and hole-in-the-wall restaurants that remind you more of a college town like Berkeley, Calif. Speaking of restaurants, there are more than a few tasty choices here. Our favorites included Teocalli Tamale, with its generous burritos and a library of palate-blowing hot sauces. And there's Secret Stash, which claims to have the best pizza in the world. Who am I to disagree? For a more formal dining experience, try the Magic Meadows Yurt, which involves a brisk snowshoe walk through the woods to a backcountry cabin heated by a wood-burning stove, with live music and a five-course meal prepared by a private chef. At the end of the day, we always found ourselves out in the snow and cold. Crested Butte is one of the coolest places in Colorado, thanks to high mountains that pull freezing air into the valley. On a clear, subzero night, trudging through the fresh powder, we looked up and marveled at a thousand stars bracketed by dark mountains. Crested Butte may be a serious resort, but at that moment I couldn't wipe the grin off my face. I think it was frozen in place.